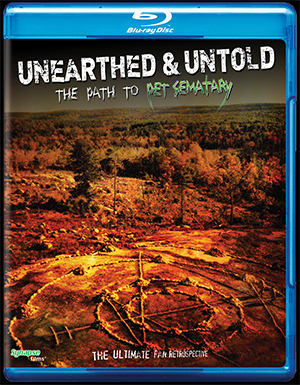 Synapse Films recently released information for their upcoming release of the horror documentary "Unearthed and Untold: The Path to Pet Semetary". The film focused on the story to bring Stephen King's "Pet Sematary" to the big screen. Special features on the Blu-Ray includes Audio Commentary with Creators John Campopiano & Justin White, Podcast Commentary with Creators John Campopiano & Justin White, Edited / Alternate Scenes, Video Interview with Creators John Campopiano & Justin White, “PET TALES – From the Cutting Room Floor” Featurette, PET SEMATARY Location Photo Compilation, Documentary Poster Art Concepts, Rare On-Set Video Footage from Rhonda Carter, Documentary Sizzle Reel, Promotional Trailer and Reversible Art Design by Alexandros Pyromallis. "Unearthed and Untold: The Path to Pet Semetary" hits retail on March 13th. In 1989, director Mary Lambert collaborated with King of Horror Stephen King to bring his best-selling book PET SEMATARY to the screen. UNEARTHED AND UNTOLD: THE PATH TO PET SEMATARY brings the shocking true story behind the film to genre fans this March. Hitting home video for the first time ever, aficionados of this undead classic can dive behind the scenes in HD glory, with a graverobber’s bounty of putrid bonus features on the film’s Blu-ray release! It's true that sometimes dead is better, but for two New England filmmakers, the story of Stephen King's PET SEMATARY was far too alluring to leave buried. That's why John Campopiano and Justin White spent nearly five years seeking to uncover the story - from book, to film, to cult status - amounting to the most comprehensive look at the horror classic ever produced. UNEARTHED AND UNTOLD: THE PATH TO PET SEMATARY is both an in-depth independent documentary and celebration of King's classic tale of terror, told through the voices of cast and crew from the 1989 hit film, as well as locals in Maine - the place where it all started. In addition to first time ever interviews, this documentary tours the many iconic locations used in the film. The documentary includes never-before-seen photographs and home video from the set. As well, this film explores the impact PET SEMATARY has had on horror fans and scholars of Stephen King's work. The documentary features interviews with director Mary Lambert, along with the cast: Denise Crosby, Dale Midkiff, Miko Hughes, Brad Greenquist, Andrew Hubatsek, Susan Blommaert, the Berdahl twins, Michael Lombard and MANY MORE!